Like so many others, my first experience of the squared-circle was of that great hour on a Saturday afternoon. My memories tend to start from around 1981, when I was six. My Dad used to drive us to the local chippy, I'd put 20p in the fruit machine and we'd come home with two bags of greasy potato and sit with it on our laps as we watched Young David, Jon Cortez, Keith Hayward, Dave Finlay and a whole host of other skilful and interesting personalities. It wasn't until I was 12 that my Dad decided that I might be trusted enough to be taken one evening to the Assembly Hall in Worthing. I didn't know where we were going at first, but as we walked into the foyer I could see the ring light shining down over the ropes. I looked around in amazement as we took our seats - about four rows back, but on the end of a row next to the aisle where it was clear at least one half of the combatants would walk down. Most of the evening's a bit of a blur and I can only really remember the supporting match-ups owing to still having the hand-bill. We started with Clive Myers vs. Psycho Stevens, Pete Roberts vs. Tom Tyrone, Mal Sanders vs. Steve Grey and, top of the bill, our own Wayne Bridges vs. Kendo Nagasaki. I couldn't believe that I was watching live wrestling, yet alone that I'd get to see Kendo Nagasaki in person! The main event started and, of course, it was full of controversy! The highlight of the match for me had to be when Nagasaki and Bridges came tumbling outside the ring, right down the aisle on which I was sitting and Bridges slammed the masked man's head into the fire-exit doors which flung open, letting an invigorating rush of February chill into the auditorium, and they continued to fight outside! The noise was deafening and my heart pumped nineteen-to-the-dozen. “They don’t do this on TV”, I thought! After the match, a young bloke who I recognised as a local who'd been standing with George Gillette during the match, came over to me and said that I could meet Nagasaki if I'd like - he'd clearly seen me hollering my support (sorry, Bill!). When the evening ended, he showed me and my Dad where Kendo's BMW was parked and after a short wait, the man himself came out wearing a black mask and climbed into the passenger seat. As people pushed me forward, I very tentatively pointed my outstretched hand at him and he grabbed it gently, slightly pulling me in, and shook my hand. Well, that was it! I was hooked, and my Dad and I spent the next few years attending every show in Worthing. In 1990 my interest in entertainment led me to do a week's work-experience at Worthing Pavilion, another of our three venues. I spot-lit a Country & Western show, I stood prompt-side during a Richard Digance gig, but on Thursday it was wrestling night! I'd been at the Pavilion for a few hours and all of a sudden I was aware of a lot of noise and clanging. The ring-crew was bringing all of the ring's components into the hall and laying it all out. I offered to help and driver/ref Dave Marshall was amused that he'd managed to collar one of the 'staff' to help out. I didn't mind one bit and, as the weeks went by I turned up earlier and earlier to the shows helping (although probably hindering at first!) put the ring up. I grew to respect Dave a great deal over the following years as he took an incredible amount of heat but, by the time he had to step out of the ring, he'd done enough to quell the rage and not get killed! I soon graduated to seconding and in my short, but illustrious career(! ), I seconded Giant Haystacks, Nagasaki, Steve Regal, Rocco, Finlay, Pat Roach, Akira Nogami, Shinji Otani, Dave Taylor and hundreds more. Seconding always kept me on the edge of my seat, but on one particular occasion, it knocked me right off! We were doing a small show at the Littlehampton Windmill Theatre and top of the bill was 'Rollerball' Rocco vs. Alan Kilby. Obviously, it was outrageous and I was on and off my seat politely keeping irate punters from exacting their revenge on Rocco's body parts. In between rounds, Rocco had poured most of his bottle of water over his head, leaving my corner of the canvas quite wet. In the following round, Kilby reversed a posting and Rocco came hurtling face-forward towards my/his corner, 'slipped' on the water and ended up flat on his back, groining himself on the ring post. However, due to the fact that I was sitting on a chair at the corner, my face was canvas-level and was in the way of Mark's left foot. He hit me smack on the left cheek, sending me flying onto my knees into the lap of a lady in the front row. I still have a 'clicky' jaw to this day to remember it by! To top it off, Kilby managed to throw most of the contents of Rocco's spit-bucket over me when Mark dodged it and took off. It was an experience…or was it a hazing?! Mark assured me it was the former at a reunion a few years ago! I was actually seconding Dave 'Fit' Finlay the night he fought Rocco when it turned out that this was Rocco's final bout ever at Worthing Pavilion. It was a fraught time and I can remember people becoming extremely concerned for his welfare directly after the match. I think possibly the greatest, most exciting pure WRESTLING match I've had the pleasure of seeing live was Frank 'Chic' Cullen vs. Ian 'Doc' Dean. It was tucked away behind several bigger-looking matches at Worthing one night, but I remember being exhausted watching it. Hard-hitting, fast-paced - it was the epitome of what a wrestling match should be. I progressed to time-keeping soon after and although at the time I felt it was less 'glamorous' than seconding, MC John Harris assured me that it was very much more helpful. As it was, I enjoyed being a bigger part of the evening and learnt a lot from John. He was everything that wrestling needed - a gentleman, a man separate from the action who didn't get involved in all the silliness. He was a great representative for British wrestling and lent an air of authority and respectability to the proceedings. He showed me how the placement of words when giving out public warnings was of great importance. Bellowing out, "The referee gives a first public warning to Giant Haystacks!" would confuse punters - were they booing the public warning or booing Haystacks? 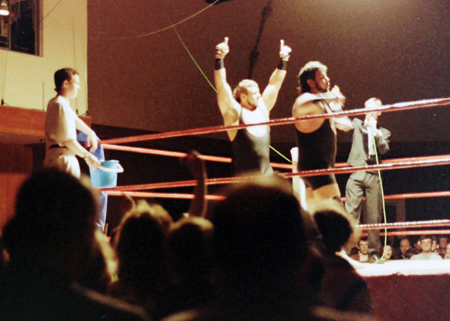 Much better was, "The referee gives Giant Haystacks his first PUBLIC WARNING!!". This, of course, provoked a huge reaction and I quickly enjoyed being able to play a very small part in crafting an exciting and memorable bout. Sitting at the timekeeper's table with John Harris (often frantically tugging his bow-tie telling the guys to go home!) was incredibly rewarding and he was the absolute blueprint of a believable and successful Master of Ceremonies. I found a card from him recently where he was writing to thank me and my brother for helping out with the ring music – he’d left all the tapes (remember them?!) at a holiday camp and there was no music for that evening’s show in Worthing. We drove to my home and my brother and I quickly recorded a few cassettes’ of music from my brother’s collection of 7” records. We made it back to the Pavilion with about five minutes to spare! 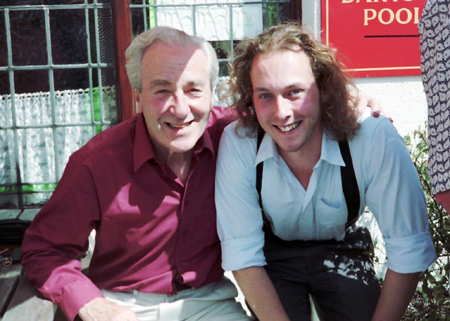 I first saw Brian Dixon selling programmes at the shows when I was watching from the crowd with my Dad. It would only be when I started working 'behind the scenes' that I realised he was the boss!! Brian's shows back then were really exhilarating (often wrestling myself with irate punters who wouldn’t sit down!) and I greatly appreciated the fact that he appeared to respect (or at least tolerate!) the job I did at time-keeping. 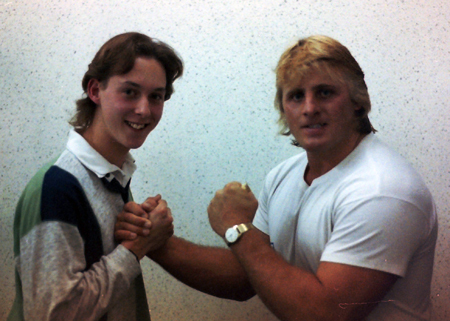 I travelled to Croydon many times and was fortunate enough once to get to meet the great Owen Hart backstage. This was just before his return to the WWF in 1991 and he was gracious enough to pose for a photo and sign my ever-increasing autograph book. That year I was also interviewed for the 'Arena: Masters of the Canvas' documentary for BBC2. Thankfully, my bit never made it to the final edit (the letter from the Producer said my "contribution has fallen by the wayside"!). I can barely remember what I was asked, but I do recall feeling rather awkward at not knowing how much my questioners knew and proceeded to give many generic and too-over-thought answers! I can imagine that if I ever saw it, my toes would curl! Around 1994, my brother showed me a paper-cutting seemingly advertising a "Wrestlers' Reunion". I felt rather unworthy, but couldn't miss the opportunity to meet some of the wrestlers I'd only got to see in my collection of magazines (I'm very lucky to own all 137 issues of 'The Wrestler'!). I tentatively rang the London number and introduced myself to the gentleman who answered the phone, telling him that I had seconded and time-kept for a number of years. He welcomed me along enthusiastically and said he looked forward to seeing me. This was great, I thought, so I asked the man his name (just in case I needed to justify my attendance at a later date!) - "My name is Wayne Bridges". "Oh... I see... I know you", I stumbled. Turning up that first year was overwhelming. 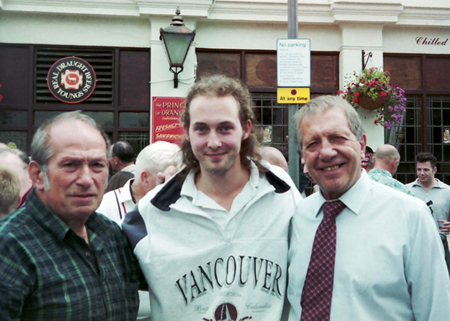 As my brother dropped me off outside the Prince of Orange, I could see Mick McManus and Kent Walton. If it was only those two, the event would have been worth the 150-mile round-trip. However, the place for the next couple of years was crawling with the stars of yesteryear - Colin Joynson, Jimmy Hussey, George Kidd, John Da Silva, Hans Streiger, Tug Holton and hundreds more. Each successive year I am more and more grateful to have had the opportunity to once again rub shoulders with those who I respect and admire from the world of wrestling. 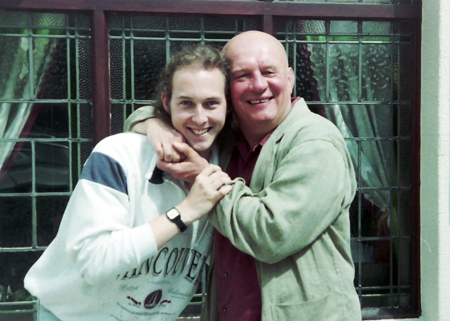 In 1997 I was finishing up a Music degree at Dartington College of Arts in Devon. At the end the year, I had to put on a recital of 15 minutes of my own compositions. I composed a piece of 'ring entrance' music entitled "Anthem for Nagasaki" which was, obviously, designed to heighten the appearance of Kendo Nagasaki at a wrestling event. Unfortunately, by this time, Kendo was between retirements! However, I wrote to him, asking that he make an appearance at my college and walk out to my bespoke music. Within days, I had a call from P.A., Lawrence, saying that they'd do it! I had to make a choice between advertising it around the college and disappointing a load of people when he didn't turn up, and not really advertising it and risk him actually arriving but performing to an empty room! I chose the first and was glad I did because on June 3, 1997, after many years of meeting him at shows and having photos taken etc., I met the man behind the mask. We stopped for a coffee (to calm my nerves!) and then I showed him the Music Studio where the performance would take place and walked him through what I needed him to do. I'd pre-recorded the music and hired a smoke-machine. The audience filed in (most people's recitals attracted 5 friends... mine had attracted over 60 people!) and the music started. At the 'peak' of the music, the side-door flung open and in strolled the legendary masked man in a plume of smoke wearing full Kendo gear. It was the talk of the college for many months and was the start of a very long-distance friendship that I feel incredibly fortunate to have made. I've also had the strange sensation of hearing it on promos on The Wrestling Channel, too! Also in 1997, I started the original British Wrestling Website. It was far from perfect, but owing to there being nothing like it at the time, I received messages from all over the world from fans and wrestlers alike. Joe D’Orazio, Danny Collins, Pat Roach and Johnny Saint were all kind enough to supply me with some biographic information on themselves and I set about providing a few pages of pictures and, more importantly at the time, a window for promoting our great sport to the public by advertising as many live shows as I knew about. I stopped updating it several years later and don’t regret doing so one bit as this site and wrestlingheritage.co.uk are a couple of absolute crackers. These days, the predominant interaction I have with wrestling is my annual trip to the reunion. Having attended the noteworthy 21st reunion, I'd like to take this opportunity to thank Joe D'Orazio for his tireless work and effusive welcomes each year, Bill & Sarah Bridges for their great hospitality and Frank Rimer for all the hard graft that goes into getting the day organised. It is an absolute pleasure to rub shoulders with so many workers who truly know what it is to have wrestled - I have to give particular nods to Colin Joynson, Keith Hayward, Jon Cortez and the late, great Mick McManus. Wrestling to me isn’t a game. It isn’t something that anyone can do (although, unfortunately, too many people have tried). It isn’t something that I ever think I could have done either. I was, however, privileged enough to be around at the tail-end of British greatness and my respect and admiration goes out to every wrestler who’s put on a pair of trunks and stepped into the ring.